Supercar fires are all too common, often times reducing once beautiful bodywork to a charred scrap heap. Even being burnt to a crisp doesn't prevent a supercar from being sold on the used market. Just recently we've seen a that was the victim of an engine fire, and a 2005 Ford GT . We doubt anyone will buy either of these cars, but what happens when your car catches fire and you aren't allowed to sell it? spotted a 2017 Ford GT owner who may be asking that very question. 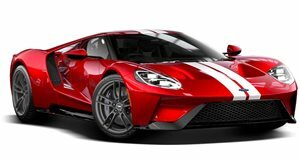 New Ford GT deliveries are well underway, but so far the news has been clear of incidences involving the $450,000 supercar. Unfortunately, a silver GT just caught fire in Germany and was severely damaged. It appears as though the fire started from somewhere near the engine bay, and could be linked to the exhaust system, electronics, or the engine itself. The rear of the GT was completely engulfed, and it looks like the car won't be salvageable without some sort of miracle. To make the story even more depressing, the GT reportedly only had 43 miles on the odometer. It will be interesting to monitor this situation, because all Ford GT owners signed a contract not to sell their cars for two years. Ford has even resorted to for breaching the contract. Since this GT is clearly unsalvageable, the owner will likely write it off and the insurance company will take it. However, we aren't aware if there are any stipulations in Ford's contract to allow owners to get rid of the car once it has been destroyed. Being forced to keep a destroyed car seems a tad unfair. It will be interesting to see how this situation plays out, and we'll keep you updated if Ford gets involved.